Proper nutrition is essential to promoting optimal growth and development for infants and children of all ages. These recommendations are intended to support early childhood professionals in making healthy choices when developing policies and practices related to nutrition. This guide is a companion to North Dakota’s Early Learning Guidelines. It offers practical ways parents, families, and early care and education (ECE) providers can promote healthy foods and eating experiences to children ages 2 to 5 years old. All information in this guide is based on current science, research and national best practices. Provide sufficient refrigerator/freezer space to store expressed breast milk. Make eye contact and talk with the infant during feeding. Respond to their reactions during feeding and their signs of hunger and fullness. offer cereal that is iron-fortified, and avoid foods that contain added salt and sugar. 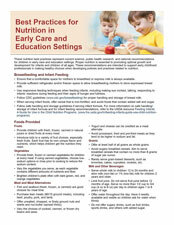 Refer to the USDA resource Feeding Infants: A Guide for Use in the Child Nutrition Programs. - Provide children with fresh, frozen, canned in natural juices or dried fruits at every meal. - Introduce kids to a variety of fruit choices, especially fresh fruits. Each fruit has its own unique flavor and nutrients, which helps children get the nutrition they need. - Provide fresh, frozen or canned vegetables for children at every meal. If using canned vegetables, choose low sodium options or rinse prior to cooking to reduce the sodium content. - Vary the vegetables you serve, as each vegetable contains different amounts of nutrients and fiber. - Brighten children’s plate often with dark-green, red, and orange vegetables. - Fish and seafood (fresh, frozen, or canned) are good choices for meal time. - Purchase lean meats (90/10 ground meats), including beef, poultry, pork, and lamb. - Offer unsalted, chopped, or finely ground nuts and seeds and nut butter (spread thinly). - Vary the choices of cooked, canned, or frozen dry beans and peas. - Yogurt and cheese can be credited as a meat alternate. - Avoid processed, fried and pre-fried meats as they tend to be higher in sodium and fat. - Offer at least half of all grains as whole grains. - Avoid sugary breakfast cereals. Aim to serve breakfast cereals that contain no more than 6 grams of sugar per ounce. - Rarely serve grain-based desserts, such as brownies, cakes, cupcakes, cookies, etc. - Serve whole milk to children 12 to 24 months and skim milk (non-fat) or 1% (low-fat) milk for children 2 years and older. - Limit fruit juice. Do not serve fruit juice before 12 months of age. Serve no more than 1/2 cup to 3/4 cup (4 oz to 6 oz) per day to children ages 1 to 6 years of age. - Offer water throughout the day. Have it readily available and visible so children ask for water when thirsty. - Do not offer sugary drinks, such as fruit drinks, sports drinks, and others with added sugar. Condiments such as soy sauce, ketchup, and ranch dressing can be high in sodium so offer only small portions, if using. Ask parents if they know of any food allergies that their child may have and document their answer along with a plan of care, if needed. The most common food allergies are peanuts, milk, eggs, soy, wheat, tree nuts, fish, and shellfish. This meal style teaches children, who are developmentally ready to serve most or all foods themselves, how to make food choices and choose portion sizes. Praise children for trying new or less-preferred foods. Do not bribe or offer treats to encourage children to try new foods. Before removing plates or offering seconds, ask children if they are hungry or full in order to help children understand their feelings of hunger or fullness. Do not require children to clean their plates. Kids typically can’t make any noise to alert you that they’re choking. Children should be closely supervised and kept within sight and hearing when eating or drinking. Be an enthusiastic role model for eating healthy foods to children during meals and snacks. 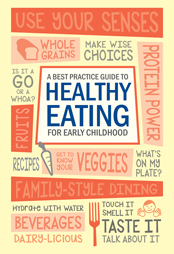 Utilize a variety of posters, books, healthy play foods, and other learning materials to promote healthy eating. Rinse all produce thoroughly under running water before eating, cutting, or cooking. Use a thermometer to check.temperatures to determine when a meat, fish, poultry, or egg dish is fully cooked. Cold food should be held at below 40°F and warm foods should be held above 140°F. Keep produce and ready to eat foods separate from raw meat while shopping, preparing, or storing them to limit the chances of food borne illnesses.